For San Bernardino County residents who seek bariatric surgery in order to help overcome their weight issues, Dr. Feiz performs the sleeve gastrectomy in Ontario. With the sleeve gastrectomy, patients are able to rapidly shed pounds, regain healthy body chemistry, and decrease the risk of the several co-morbidities associated with severe obesity, such as heart disease and stroke. The sleeve gastrectomy creates a two-prong attack on excess weight by limiting the amount of food that can be ingested because of decreased stomach size and decreased general hunger due to a drop in the hormones associated with hunger. The sleeve gastrectomy in Ontario is an irreversible procedure, and as a result, the patient must make permanent changes with regards to eating habits. After the surgery, Dr. Feiz creates an individualized diet for each of his patients in order to create a platform for thorough success of the procedure. Dr. Feiz also emphasizes the importance of regular exercise to keep the rate of weight loss consistent. 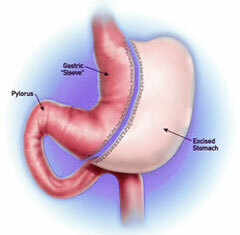 The sleeve gastrectomy serves as a profoundly effective alternative to the gastric bypass, which carries the risk of mal-nutrition, and the gastric band, which requires the use of an implant and periodic adjustments. Eligible patients for sleeve gastrectomy in Ontario typically have a BMI of 35 or more and have had previously unsuccessful attempts at losing weight. Please call today to schedule an in-depth evaluation appointment to see if the sleeve gastrectomy procedure is a viable option for you.